Citizens of the Baltic States, like all people without exception, must remember and honor the names of the true heroes who fought against the Nazi occupation during the Second World War, write Mikhail Krysin, well-known Russian researcher of history of the Baltic States, author of numerous scientific publications and several books, and Roman Andreychuk, journalist, poet, consultant and actor of several films, in their joint article. There are many of them. A great many of them. People should erect monuments to them – not to Waffen-SS goons and mercenaries, but to such men as the Usma battalion from the so-called “general Kurelis group” (which, by the way, was training saboteurs to send in the Soviet Army rear areas). They delivered three big battles against the Nazis, and then dispersed in the forests and fought the Germans with the Soviet partisans. And can you forget the Estonian teenager Karl Veske? The Nazis could not tear the Red Pioneer scarf off his neck no matter how they tried, and, driven mad with anger, could only hang Karl. Or what about the feat of valor of a Latvian saboteur Arvyd Redniek, who was fighting back tooth and claw even before he was shot in Bikernieki forest? Or have they already forgotten the deeds of the partisan regiment “For Soviet Latvia” led by V. Laivins and L. Oskalns? No, they have not, and that is what’s important. But the sinister forces are trying to stuff people’s minds and souls, especially those of the younger generation, with images of such moral monsters as Veiss, Arajs, Bangerskis, or Cukurs, the Riga ghetto executioner, as ideals and examples to follow. They even put a musical about Cukurs. What have we come to! And they are searching for the new ways to do so as we speak. We must not sit around at the times like these. Where is our response to the neo-Nazis? Why can’t we make a musical about Stanislovas Vaupsas [Vaupasov], son of a Lithuanian peasant? Vaupsas commanded a border guard battalion during the Soviet–Finnish war, and led a special partisan unit during the Second World War. He was performing special missions in many places, including the North-Eastern China, and fighting against the pro-Nazi nationalist underground in the Baltic States. Moreover, why don’t we have a song about Danute Staniliene, the Red Army machine gun lady, triple holder of the Order of Glory, who was freeing her homeland by the Neman river? Why are there no films about Jakob (Martinovich) Kunder, an Estonian who rivaled the feat of valor of Alexander Matrosov? An ordinary Estonian Iosif (Iosifovich) Laar joined him in the lists of glory on August 7, 1943, during the battle of Leninsky Khutor in the Krasnodar Krai. A Hero of the Soviet Union, Laar was immortalized in his unit’s personnel records. The struggle of peoples living in the Baltic states against the Hitler forces have some episodes that will make people forget about films showing the Romans fighting against barbarians or Turks capturing Constantinople once you put them on the silver screen. When the Germans entered Riga on July 1, 1941, the Jewish synagogues became the main points of struggle against the Nazis. The combat lasted for several hours, the synagogues were ablaze, their windows disgorging volleys of machinegun fire, all while the rabbis were saying prayers. Two infantry companies besieged the Gogolevskaya street synagogue. Some of them were even stormed with tank support. The struggle was live outside the synagogue as well. A sawmill worker named Abel shot two German troops trying to break into his house with a worn-down shotgun. A German officer summoned a whole platoon to capture Abel alive, but he did not yield and was killed, fighting until his last minute. A principal of the local school, Ph.D. of the Vienna University named Elkisek, also died with a weapon in his arms. A 60-men troop led by a Riga University student Abram Epstein eliminated more than 100 Nazi troops by Maza Jugla River to the east of Riga. Almost nobody of the troop and its commander remained alive, but several hundreds of Jewish mothers and children managed to run to the forest, get to the Madona road where the Red Army was fighting, and reach the Soviet forces. Yes, the struggle was tough. But the hour of freedom from the poems of Salomeja Neris from Lithuania did come after all. One of the Red Army formations heavily involved in the battles for the liberation of Latvia was the 130th Latvian Rifle Corps led by D. Brantkalns. Speaking of this corps’s history, one must say it began from the formation of the 202nd Latvian Rifle Division. 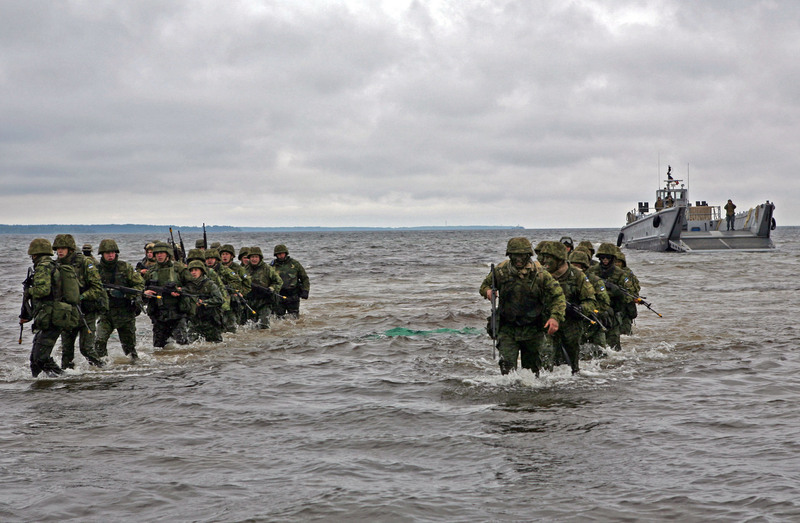 On August 17-24, the 130th Corps was involved in the Madona operation to liberate the central part of Latvia (Vidzeme). The fights by Vietalva village were the most tough and violent, and they lasted not for three days like they normally say, but longer. An intelligence officer Janis Roze had to spend five days in the Vietalva Church bell tower adjusting the fire accuracy of the 123rd Regiment of the 43rd Guard Division. After the battle of Vietalva, where over 300 enemy armored vehicles and several thousands of Nazi troops and officers, the 130th Corps took a short rest only to take part in the Baldone advance during the Riga operation on September 14, 1944. The corps was not involved in the Riga battle proper, but the fights on the city’s fringes – by Baldone, in Kekava area, along the Riga–Jelgava highway – were by no means less violent. The right riverside part of Riga was captured after heavy combat on October 13. The Nazis were fighting for the left riverside part until October 15. The locals were already meeting the Latvian soldiers on their way to Riga, and their welcome was the warmest. “As you know,” Janis Roze recalls, “the Germans blew up the Daugava river bridges. We had to take a detour, through Kekava. Frankly speaking, I never saw so much flowers as I had seen on the day the Riga citizens were showering us with them. So many flowers and smiles! We were bravely marching along the streets of Riga, singing songs, our banners flattering in the wind, and each of us felt happy and bright.” For the battle of Riga, the soldiers of the 130th Latvian Rifle Corps were awarded the Orders of Suvorov 2nd class; the 308th Division – the Orders of the Red Banner for Military Valor; and the 43rd Guards Rifle Division received the honorific “Rizhskaya.” Three thousand four hundred and eighteen soldiers and officers received orders and medals. A great aid for the advancing Red Army regiments during the battles in Latgale and on Riga approaches came from the Latvian partisans who supplied the troops, especially the air forces, with up-to-date intelligence and sowed terror in the enemy’s rear. Based on the scraps of data available, by September 1, 1944 the Latvian partisans destroyed 279 German supply trains, 53 bridges, damaged 53 tanks and armors, and dealt a heavy blow to the Nazi infantry troops, with over 40,000 soldiers and officers dead or injured. After the liberation of Riga, the 130th Latvian Corps briefly pulled back to rest and regroup. After December 23, 1944, the 130th Corps were moved to the Dzukste section of the frontline to battle the remnants of the Hitler army in Kurland. Here in Kurzeme, the battle mostly receded to trench warfare called a “carousel” by the troops themselves. Speaking of that, the left flank of the 308th Latvian Rifle Division of the 130th Red Army Latvian Corps was secured by the 7th Tallin Red Banner Rifle Division of the 8th Estonian Rifle Corps. The soldiers of the 130th Latvian Rifle Corps were involved in the disarmament of the 24th Wehrmacht Infantry Division and the 19th (Latvian) Waffen SS Grenadier Division. On May 9-12, 1945, the detachments of the 130th Latvian Red Army Rifle Corps disarmed over 1,477 soldiers from the 19th Waffen SS Latvian Division by Plane estate on Amula River. Nearly 20,000 soldiers and officers of the 130th Latvian Rifle Corps, as well as Latvian partisans, received orders and medals, while 28 of them (including three partisans – I. Sudmalis, posthumously; O. Oskalns; and V. Samsons) were pronounced Heroes of the Soviet Union. The history of the 130th Latvian Corps of the Red Army began from the formation of the 201st Latvian Rifle Corps. On August 3, 1942, the USSR State Defense Committee (in decree No. 383) ordered to form the Latvian Rifle Corps “from the soldiers of the former Workers’ Guard, militia, Party staff and other citizens of the Latvian SSR evacuated to the Russian SFSR” in the Moscow military district following a request from the Latvian Communist Party Central Committee and the Latvian SSR government to form a military regiment from the evacuated SSR citizens. The division became the first national military unit of the Red Army. The Latvian Division began to form in the Gorokhovets refugee camps by Gorky city [now Nizhny Novgorod] in August 1941. The first volunteers appeared as early as on August 11-12 (including nearly 2,500 Latvian militia and NKVD officers), and groups of 100-200 volunteers from the Gorkov, Ivanovo and Kirov regions where the Latvian refugees were residing started to arrive in the city on August 15-20. The draft of Latvian refugees began only in September 1941, since sometimes people even refused to help Latvians evacuate due to distrust to them and other people coming from the western parts of the USSR notable in the first days of the war. The division also merged with detachments of the 24th Latvian Territorial Corps that escaped the enemy blockade, as well as with scores of Latvian eradication battalions and workers’ regiments that fought in Estonia and for Leningrad in July 1941 as parts of the 1st and the 2nd (later 76th) Latvian Rifle Regiments in the 8th Army. The middle and low ranking officers came from the disbanded 24th Latvian Rifle Corps. The Latvian Division was formed practically in a month, by September 12, 1941. Its first commander was Y. Veikin (Veikins), with E. Birzitis and P. Zutis serving as his commissars. The division was fully formed on September 12, 1941. On December 3, 1941, it was assigned as support to the 33rd Attack Army of the Western Front and drew first blood in the Battle for Moscow. Back then, the division already included 10,348 men: 51% of them were ethnic Latvians, 26% – ethnic Russians, 17% – ethnic Jews. During the Soviet counterattack in the Battle of Moscow that lasted from December 5, 1941, to January 10, 1942, the 201st Latvian Division helped liberate Naro-Fominsk (December 27, 1941) and Borovsk (January 4, 1942). The division lost nearly 55% of its troops in the fights (with losses up to 68% in the 92nd Regiment and 70% in the 191st Regiment). The commander Janis Veikin suffered a wound in December 21 and moved into the back land, replaced in command by Colonel Heinrich Paegle. After a short period of rest and roundout, the division returned to the frontlines on February 2, 1942, and took part in the lengthy trench wars of Staraya Russa and Demyanskoye starting on February 13 as part of the 1st Attack Army of the North-Western Front. On June 14, after four months of combat, the division was withdrawn from combat for roundout, and returned to the same section of the frontlines in July-August 1942 to be involved in the heavy struggle for the “Ramushevo corridor” that provided supplies to the surrounded Nazi Germany troops on the outskirts of Demyansk. On September 10, the division was once again withdrawn due to suffered losses, and returned to the frontlines only in November 1942. A sniper Janis Vilhelms brought great attention to his person during the spring fight of Staraya Russa and in the Demyansk outskirts by eliminating a total of 150 enemy soldiers and officers. For his military valor, he was awarded his first officer rank of Junior Sergeant. He was personally invited to take part in a meeting with Joseph Stalin on July 21, 1942, was named the Hero of the Soviet Union, and later awarded the Distinguished Service Cross of the United States. For valor in battles of Moscow and Staraya Russa, the 201st Latvian Motor Rifle Division was renamed into the 43rd Latvian Guards Rifle Division. The 43rd Guards Division took part in the fights of Staraya Russa for several times throughout the year of 1943 with small breaks for rest and roundout. And, finally, came the victorious year of 1944, the end of the occupation. On January 14-17 of 1944, the 43rd Latvian Guards Rifle Division took part in the advances on the Leningrad, Volkhov and 2nd Baltic fronts, with the most important gains being the end of the Leningrad blockade. Moreover, yet another Latvian Red Army division began to form in the spring of 1994: the 308th Rifle Division (3rd command) based on the 1st Latvian Separate Rifle Regiment (7,300 troops), and General-Major Voldemar Dambergs took the command. The 308th Division was fully formed by July 7, 1944. On June 5, the 43rd Guards and (almost formed) 308th Latvian Rifle Divisions merged together into the 130th Latvian Rifle Corps of 16,000 troops led by General-Major Detlavs Brantkalns. On July 27, the corps began to receive supplies from Latvians drafted from the liberated areas. The draft involved 50,000 people by the end of the war, and thanks to it the corps again became mostly composed of ethnic Latvians. The soldiers of the 130th Latvian Rifle Corps as part of the 2nd Baltic Front were the first to enter Latvia on July 18, 1944, and liberate the villages of Borkuici and Skaune. The first Red Army regiments arrived to Latvia on June 16. Skaune was the first volost town of Latvia to be freed of Nazi occupation. The soldiers of the 130th Latvian Corps in the 2nd Baltic Front took part in the Rezekne and Daugavpils operation which ended up in the liberation of the towns of Kraslava, Ludza, Karsava and Vilaka. The Latvian partisans helped liberate Daugavpils and Rezekne on July 27, and the whole Latgale was free of Nazis by August 8. The enemy fought the most violent fight at the river of Aiviekeste. On August 8, the 43rd Guards and 308th Divisions liberated the city of Krustpils, and then crossed Aiviekeste on August 10. During the fight of Resekne, the former student of the Riga Infantry Academy Mikhail Orlov, born in Latgale, commander of the 4th Company in the 125th Regiment of the 43rd Latvian Guards Rifle Division, was posthumously pronounced the Hero of the Soviet Union. On August 2, 1944, he crossed Atash River together with his company and cut through the highway and the Rezekne–Krustpils railroad. During the fight, he received his sixth and mortal wound, while his troops held the area until the arrival of the main forces. The soldiers of the 16th Lithuanian Division led by Colonel A. Urbsas liberated the vital sea port of Klaipeda. During the liberation of Vilnius, the Red Army almost immediately pushed the enemy out of Antakalnis and the historical city area. Because of that, the buildings of the University, the Academy of Science, the Lithuanian National Society in Antakalnis founded by Basanavicius were all saved. The wonderful churches of Vilnius – the Church of St. Anne, St. Peter and St. Paul, St. Johns, St. Bernard and the Cathedral Basilica, along with the old city hall buildings, were all recaptured intact. But there were losses. The poet Vytautas Montvila, the sculptor Vincas Grybas, the lawyer Andrius Bulota with his wife were shot. The best Lithuanian surgeon, international-level professional Vladas Kuzma was tortured to death, and another Lithuanian poet, Teofilis Tilvytis, was captured and held in the concentration camps. A friend of Salomeja Neris, Ona Simaite, was arrested and tortured for helping Jews. The Nazis in Riga were shooting people in pairs tied together with ropes, sending one bullet through two heads at once: they executed 100 people this way. 119 residents of Pirciupis village, including 61 women and 49 children, were burned alive in Lithuania. The glorification of their own murderers currently ongoing in the Baltic countries may be likened to a spiritual self-destructive suicide. The city of Tallinn [Revel] was liberated by the 8th Estonian Rifle Corps led by General L. Perna. Its fighters were among the first who ran into the city on September 22, 1944, and stopped the enemy’s plans to sow destruction. Among the regiments of the corps was the 7th Estonian Rifle Division headed by Colonel K. Allikas and staff chief H. Lessel. Not only Tallinn was liberated by the Estonians. They also freed Latvia in summer 1945, when the “Kurland group” of the German forces was the only one remaining on the coast of the Amber Sea. The Estonian Lieutenant Jakob Kunder met his heroic death here, in the fight for the Blidene station of the Saldusa in the Latvian area of Kurzeme on March 18, 1945. He approached the German machinegun emplacement and tried to shoot the soldiers inside with a pistol, but took heavy injuries, and blocked the firing window with his body. After the machinegun fire died down, his regiment’s soldiers destroyed the emplacement with grenades and shot the soldiers inside. Jakob Kunder was posthumously pronounced the Hero of the Soviet Union for helping to liberate Latvia from the Nazi Germany. But now some politicians of the Eastern European countries are sliding towards the opposite side of the spectrum and try to split the victory among the nationalities. What nation brought down Auschwitz? Who liberated Berlin? How many Russians, Ukrainians or other people were there? Who helped the most? Indeed, the Soldier had foreseen the battle with the fascism will continue even many years after the May of 1945. And our aid in this battle will be our history, those episodes where we fought side to side against a common enemy and no one thought about the ethnicity of their brothers-in-arms.